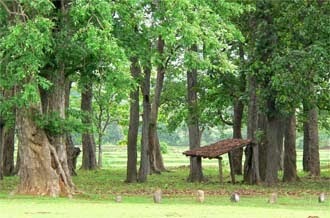 In this day, Priest is the person who starts this by purifying their doors with dung then they go to the ‘Jaher than’ (holy grove) in their village and set up an abode for the deity. Later the priest offers prayers. The worshipping place for ‘Bonga - Buru’ is also washed , First night of this day the priest acknowledge their ancestor, God following ‘Marangburu, Jaherenera‘, etc. 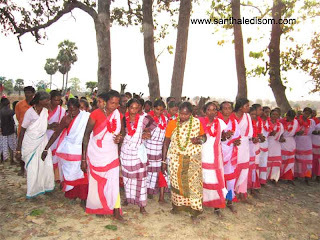 On the second day, the Santals once again gather at the ‘Jatherthan’ singing and dancing, and the priest after offering prayers, performs various rituals in honor of the deity and their ancestors and he gives the ‘Sal’ flowers which is distributed and all wear them. Men tuck these behind their ears while the women adorn their hair with these. Men and Women of village dance ‘ Baha enenj’ on this occasion in ‘Jaherthan’ in the music of traditional musical instrument played by the men. They also sings the ‘Baha serenj’ while they finished the some round of dancing. After this tradition dance, the priest hands over the pitcher to the bachelor boy of that village. Soon the priest heads to his home, while entering to village the all women dancing go along with the priest to respect him and it is being danced till they reach to priest house, having reached to priest house again women dance ‘Baha enej’. While entering into village passing by all the houses, the women wash priest’s feet and he gives them Sal flowers as per tradition. 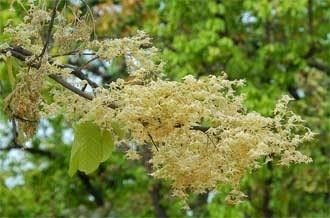 Sal flowers have a special significance for the tribals. 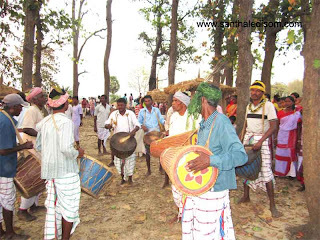 Third day, Santal cheers each other with enjoying and also they have some enjoying moment with the guest came in their houses. This day, people sing the folk songs and dances cheerfully with each other. They enjoy the feast of meats and ‘Jil Pitha’ (A tasty bread of rice mixed with meat). Note: The content above is for the basic introduction of Baha festival, really there are a lot more things to be shared but unfortunately we couldn’t. Johar ! !..Thanks and stay in touch with us.. Very informative; thank you so much !!! It is very good and helpful article to give and gain knowledge about this to our youngsters and the santhal people of coming new generation. Sarna dharam is the best dharam of india.